The Oly Mountain Boys | Pacific Northwest Bluegrass | Blog : White Horse off to print! 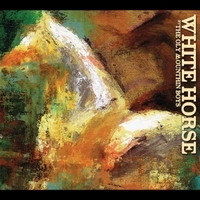 White Horse off to print! The Oly Mountain Boys think you could all use a little good news today. White Horse is OFF TO PRINT! We'll have it soon, and so will you! We've seen some proofs that have us convinced that this album is going to look (and sound) really amazing. Combining some hard driving original bluegrass with some amazing writing, beautiful art, and the graphics work of Euphoria Tea Productions... well, let's just say we think you're going to like what you see. We're excited to announce also that we've signed on with Sue DuMond to help us get the word out about it. We're going to have a series of shows in September and October to celebrate our new release. On September 20th, we'll be partnering with the Washington State Historical Society for a grange-style White Horse event that celebrates the pieces of Washington history that inspire the backdrop for this album. On October 2nd, we'll have a web concert through ConcertWindow for you far-flung OMB fans! And on October 4th, we'll party down at Rhythm and Rye on Artswalk with The Hollerbodies of Portland and the Warren G. Hardings from Seattle! But if you can't wait that long, find us sooner - like this week!